SPUTNIKNEWS – March 7, 2018: Foretold in the month of August 2017 on CNBC was the possibility that disruptive forces would try to have Gary Cohn resign to dismantle President Trump’s economic team. And on Tuesday (March 6) the former Goldman Sachs investment banker Gary Cohn resigned from his White House position as director of the National Economic Council after the commander-in-chief declared his intention to apply import tariffs to all aluminum and steel products entering the US. And it appears that tariffs are what finally pushed Cohn to resign. Both Cohn and US President Donald Trump made glowing statements about each other in the latest White House departure, with Cohn expressing gratitude for the opportunity to contribute to the “historic tax reform” passed by the Trump administration last month and the president calling Gary a “rare talent” and commending him on a “superb job.” However, the laudatory statements may only thinly veil a deeper divide. “I think this is telling, that there is so much chaos in this White House. So many unqualified people have been chosen for positions they didn’t belong in and now they are being either pushed out or running for the door. It is great this president can’t govern for his agenda. It’s a sight to see,” said columnist Ted Rall. BATTLEFORWORLD – August 17, 2017: There is a saying, “if you didn’t mean it, you would not have said it”. 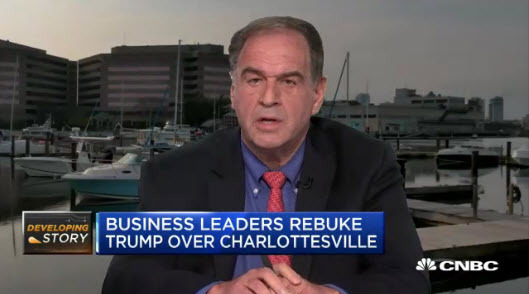 And so Yale School of Management’s Jeffrey Sonnenfeld appeared on CNBC network with what seems to be an ominous message for President Trump. That a Gary Cohn resignation could be a hit to Trump’s plans to revamp the tax code. Some analysts suggest that the promise of tax reform and other pro-business legislation by Trump is partly responsible for the stock market’s rise since the election. And that the markets would crash if top White House economic adviser Gary Cohn resigns. Reiterating, “I think if he steps away, it would crash the markets,” says Sonnenfeld. And so Deep-State…machinations to remove Trump from the White House are still ongoing, and now they are targeting his business team. In what appears to be, to bring about a planned stock market crash, to panic the public so that they will turn against Trump in force. And the public has on so many occasions witnessed panic news reporting in media and the media has become brilliant at it (for example North Korea). MARKETWATCH – March 8, 2018: U.S. stock benchmarks closed mixed on Wednesday, paring the worst of its early losses, after Gary Cohn, the head of President Donald Trump’s National Economic Council, resigned late Tuesday (March 6). His decision to leave the role as the president’s top economic adviser underlines a fear that Trump, who last week announced tariffs on aluminum and steel, is increasingly adopting a protectionist stance. Many strategists and traders see that as a threat to the economic expansion should they spark a global trade war. Cryptolium: Blockchain To Rule The Skies?